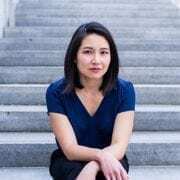 Kirstin Chen‘s new novel, Bury What We Cannot Take, has been named a Most Anticipated Upcoming Book by Electric Literature, The Millions, The Rumpus, Harper’s Bazaar and InStyle, among others. She is also the author of Soy Sauce for Beginners, a Kindle First selection, an O, The Oprah Magazine “book to pick up now” and a Glamour book club pick. She was the fall 2017 NTU-NAC National Writer in Residence in Singapore, and has received awards from the Steinbeck Fellows Program, Sewanee, Hedgebrook, and the Napa Valley Writers’ Conference. Her short stories have appeared in Zyzzyva, Hobart, Pank, and the Best New Singaporean Short Stories. She holds an MFA from Emerson College and a BA from Stanford University. Born and raised in Singapore, she currently resides in San Francisco, where she is working on a novel about the counterfeit handbag trade.